Stellar Metamorphosis: Where are the Stars Earth Orbited in the Past? In short, the stars Earth used to orbit have evolved greatly themselves and resemble "planets". This is mainly due to young stars losing their mass much faster than older ones. As a rule of thumb the older the star gets, the slower its mass loss occurs. This is far beyond where the dogma is. They can't even figure out where brown dwarfs fit yet. They are intermediate aged stars that straddle the zone between massive youngins, and old fart stars. They are stellar teenagers. Just click to make it bigger. This is what I will be using to determine how evolved stars are. It is a rough estimate and will be adjusted as time goes on, it mostly serves as a perceptual tool. Baz did a great job designing it! We have been going back and forth for a few days now, but this is the first time the Krypton Hypothesis (smashed up stars) are included in depth. Abstract: It is explained that the iron/nickel cores of ancient stars are composed of unconsumed catalyst used in the chemical reactions required to form many chemical compounds found on rocky highly evolved stars. As well, it explains why only specific elements are found with the iron/nickel composites, it is because they are also function as catalysts, such as platinum, copper and gallium, which can be unconsumed in the process. Iron/nickel meteorites are pieces of the core remains of long dead, smashed up astrons (young astrons are stars, old ones are planets). They are mostly the heavy metals iron and nickel, but also contain trace amounts of platinum, copper, rhenium, osmium, iridium and others that can resist being consumed in chemical reactions. Of course some more resistant to being consumed than others. Given astrons are the location for the vast majority of chemical reactions in the universe, I am proposing that the chemical reactions are helped along by catalysts. These catalytic materials, iron and nickel mostly, enter the young astron (star) and spur synthesis and decomposition of various chemicals on huge scales. The left over catalytic iron/nickel then sinks into the interior due to not being consumed, thus forming the cores. This means large cores of ancient astrons are indicative of large amounts of chemical processes having occurred in the astron's past, as they are unconsumed and in vast quantities. This also means the densities of the oldest astrons plays a part in whether they have large iron cores, and lots of rocky material. If the density of the planet is high, say about 5 gm/cm^3, then the chances of it having a large iron core are high. Since the iron core shows direct evidence of past chemical reactions having taken place in huge amounts, then we can also expect the rocky material that planet to be made out of to be just as complex as Earth's. The other elements that do not function as good elemental catalysts such as fluorine, oxygen and nitrogen should be expected to be almost non-existent in pure iron/nickel meteorites, as they would have been consumed well before any in-falling of material could occur. The only way for oxygen or other non-catalytic elemental material to fall inwards during planet formation would be if it is combined with other heavier material, and become mostly unreactive, such as silicon dioxide or olivine. Even then, the heats and pressure involved in internal deposition processes (planet formation inside the star), would possibly break apart any newly formed silicon dioxide or magnesium/iron silicates. They would remain towards the border of the collected unconsumed iron/nickel catalyst, thus forming the boundary between the inner and outer cores, and in many places mixing forming beautiful pallasites. Pallasites form the boundary between the inner pure iron/nickel regions of the cores of dead stars where the collection of unconsumed iron/nickel catalyst took place and the outer core layers. I put this here for future reference so people can study what happened, and in the future maybe we won't make the same mistake. Then again, history does repeat itself. 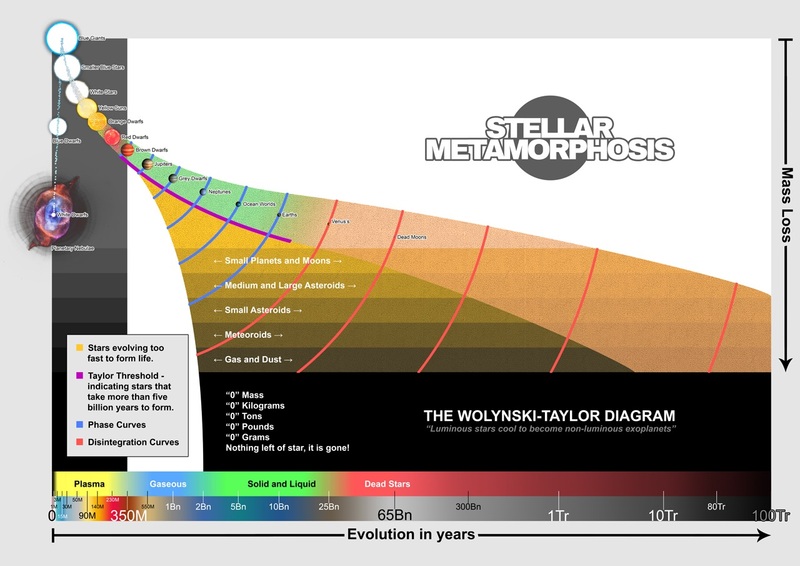 All star systems are polymetamorphic/polymetamorphous. This means they contain stars in various stages to their own metamorphosis. Stars of all kinds orbit each other. Since they are all in different stages to their own metamorphosis, they are poly (many) meta (after) morphous/morphic (having a specified shape or form). A short list of differences between stars in our system and others is provided. As well, a short example concerning planet formation coupled with the field of molecular dynamics is provided. It is clear, planet formation (stellar evolution) is the most complex process in the universe, and stellar metamorphosis is the theory we will use to explain it, because it is the only theory that combines all the sciences together into one. I'm beginning to realize planet formation is extremely complex, far beyond my capacity to do it justice. That being said I will continue to do my best to explain how planets are made (stars evolve).